Saving a DriveWorks 3D File from SOLIDWORKS is easy but it can have an impact on performance. In this topic we are going to look at how to make these files more efficient. The tips in this topic will make 3D files smaller, more efficient and quicker to load. Your Documents Image Quality has an effect on DriveWorks 3D Files when they are saved from SOLIDWORKS. A higher image quality will create more triangles and more data within the Part. This data is then saved to the DriveWorks 3D File. Reducing the number of triangles (quality) will reduce the DriveWorks 3D File size and your Part size. Open your SOLIDWOKRS Part in SOLIDWORKS. In the menu bar, go to Tools > Options. Select the Document Properties tab. And select Image Quality from the left hand side. The following dialog should appear. 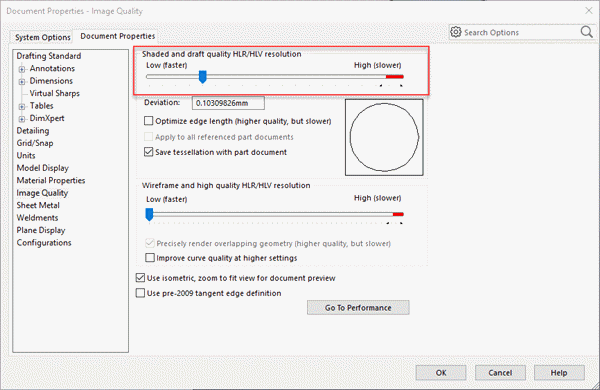 Change the "Shaded and draft quality resolution" to reduce the quality of the model. The following shows a Sphere at varying qualities. Note the file size difference as the quality is decreased. 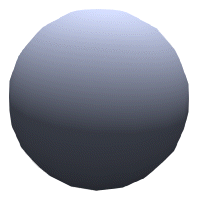 The main reason for this file size increase is due to the number of triangles in the model that have to be saved. Here is how each model appears in DriveWorks. You can visibly see the difference in the number of triangles that are saved. You need to make a decision on how detailed you want your models. There is a trade between performance and detail. You need to find a balance between the two to get the most out of DriveWorks 3D. It gets to a point with detail where you visibly see no difference from one model to the next. Notice how the Medium model looks almost identical to the High resolution model. Don't have high resolution models when working with DriveWorks 3D. Find a balance between quality and performance. When working on the web, you want your DriveWorks 3D Files to be as efficient as possible.